Dr. Stallworth is a super talented and caring facial plastic surgeon in San Antonio, Texas. His work pretty much speaks for itself, but we also wanted his potential patients to know how much passion and care goes into his work. We knew that the best way to do this was to let him and his patients do the talking through quality patient reviews and Q+A’s with the doctor himself. See how Vuepoint combined real patient voices with technology to create a platform that keeps Dr. Stallworth’s schedule full. Everyone needs to have their business on the web. It’s the first place people go to shop around or to simply learn more about you and your business. We completely redesigned Dr. Stallworth’s website to have a fresh, new look and as well as organized content. When someone wants to pursue plastic surgery, they typically do quite a bit of research before even scheduling a consultation. Specific and quality content on the website is not only good for SEO, but can act as a resource for visitors while also building trust in the surgeon, Dr. Stallworth. Our ultimate goal with the site is to have the prospective patient contact Dr. Stallworth’s office to schedule a consultation. We make that as accessible as possible for the user no matter what page they are on. 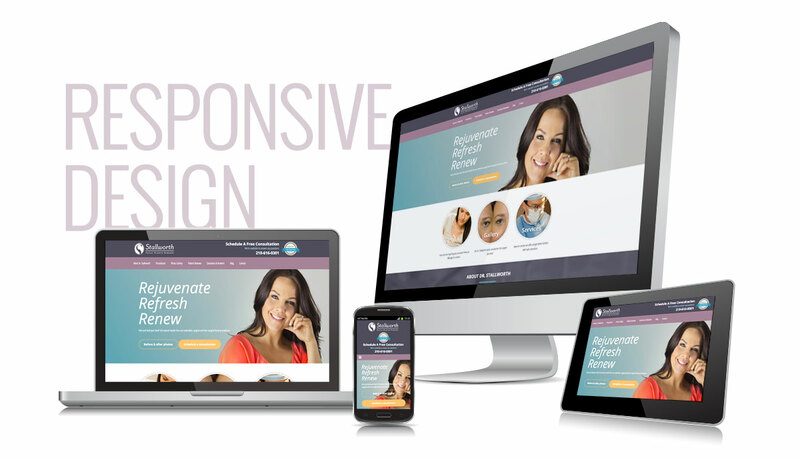 And of course, we believe in mobile friendly websites, so we were sure to hook up Dr. Stallworth with a fully responsive website. Dr. Stallworth was the perfect candidate for this type of functionality. Because of his natural inclination to help people, he was already active on RealSelf.com, a website dedicated to helping users find the right cosmetic treatment and doctor through a community of forums. We were able to utilize a plugin to showcase his interaction with user questions. This is a great way for him to share his expertise in related facial plastic surgery categories like botox, cleft lip repair, ear surgery, facelift, and much more! What better way to gain trust right off the bat than by reading legitimate patient reviews? We know that cosmetic surgery may be a private matter for many, but we also understand that even a few honest reviews can make all the difference. The Facebook commenting plugin implemented to stallworthfacialplastics.com verifies each review with a Facebook account login. This functionality also allows Dr. Stallworth to be notified whenever he receives a new review so that he can respond accordingly. To ensure that each patient is being asked to leave a review on their experience, we created a simple handout that helps guide the user through the process. Over time, this process will build up a good foundation of high quality reviews. As digital marketers, we like to combine print materials with our digital efforts! Since launching the website in 2016, four ecstatic patient reviews have been submitted. Dr. Stallworth has also continued to be active on RealSelf.com answering user questions, which continues to add his expertise to his Q+A page. Our continued SEO efforts are helping Stallworth Facial Plastic Surgery stay competitive for keywords like “rhinoplasty surgery san antonio” or “facial plastic surgeon san antonio” and many others. We love continuing to work with our clients even after the final website design has been published. It allows us to utilize all tools to create campaigns to help them grow as a business.